It seems a reasonable assumption that anyone who’d be willing to spend a few hundred dollars on a pair of headphones is probably the type of person who has a passion for high quality audio. That, or they work for the government. We’re fairly sure [Daniel Harari] falls into that former category though, given how much thought he gave to adding a decent microphone to his Sennheiser HD650 headphones. Not happy with the results he got from microphones clipped to his shirt or mounted on a stand, [Daniel] realized what he really wanted was a sensitive boom microphone. This would be close enough to his mouth that it wouldn’t pick up stray noises, but at the same time not obstruct his field of view or otherwise get in the way. He found a few options on the market which would allow him to mount a boom microphone to his HD650’s, but he didn’t want to stick anything to them and risk scratching the finish so those weren’t really an option. [Daniel] decided to go the DIY route, and eventually settled on a microphone that would mount to the headphone’s existing connector which plugs in at the bottom of the cup. 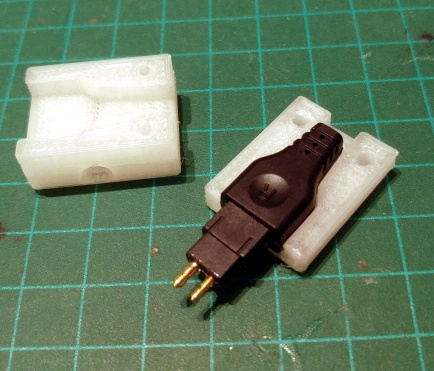 To make his mount, he 3D printed a two piece clamp that could be screwed together and securely attach to the connector without making any permanent changes. Once he had that base component printed, he salvaged the flexible metallic neck from a cheap USB light and used that to hold the female 3.5mm connector. Into that he’s plugged in a small commercially available microphone that is usually used on voice recorders, which [Daniel] said sounds much better than even the larger mics he had tested. Finally, he used Sugru to encapsulate the wires and create a flexible strain relief. The whole assembly is very light, easily movable, and perhaps most importantly, didn’t require any modifications or damage to a pair of headphones which have a retail price that could double as a car payment. It’s been a few years since we’ve seen anyone brave enough to hack their pricey Sennheiser headphones. But in the past we covered a modification which gave them an infusion of Bluetooth and even one that reversed a sneaky manufacturer hardware limitation. 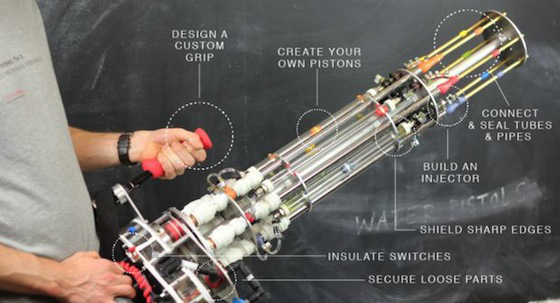 Gatling Gun Styled Water Pistol Made Out Of… Sugru? We admit it – we’re suckers for clever advertising of a product. The company behind Sugru, everyone’s favorite self-setting-rubber-fix-it material commissioned this awesome gatling gun styled water pistol, and it’s actually quite impressive. Designed by [Alex Bygrave], he was instructed to build the gun out of as many standard hardware store parts as possible — and as much Sugru as he could. It’s been used to make all the seals, connections, and even the pistons, and while we can’t tell if it leaks anywhere, it’s still pretty impressive. Unlike a normal water pistol, this one is powered by compressed CO2 canisters like the ones used for welding — meaning the pressures are much higher than a typical super soaker as well! 19Stick around after the break to see it in action – tested on the staff of Sugru themselves! Need a custom link that’s strong and flexible? [RobotGrrl] came up with a method of molding flexible links using 3D printed parts and Sugru. The link consists of two 3D printed hubs, connected by a flexible material cast in a 3D printed mold. [RobotGrrl] recommends using Sugru to create the link, but you can use homemade Oogoo as a low cost substitute. Dish soap is used as a release agent, and prevents the Sugru from sticking to the mold. The tutorial includes a detailed guide to modeling the parts in Autodesk Inventor, which serves as a quick introduction to the CAD tool. If you just want to make some links, the STL files are available for immediate 3D printing. Why would you want DIY flexible links? [RobotGrrl]’s Baitbot is a good example. This tentacle robot uses the links as its core. Check out a video of the Baitbot wiggling and jiggling after the break. We can’t see much without our glasses (which is why our habit of shaving in the shower often ends badly). Our glasses cost a bundle, but we wear them every waking moment so it’s worth it. But only recently did we break down and spring for prescription sunglasses. However, when it comes to sports we don’t pony up the dough for dedicated specs. Here’s a hack that will change that. If you’ve still got your last set of glasses on hand hack up the lenses for swimming goggles or other applications. In this case [Dashlb’s] lenses were already small enough to fit in the goggles. He simply added a bead of Sugru around the edges to hold the lenses in place. But if you do need to cut them to size aligning the lenses with your eyes is important, so we suggest the following: have a buddy stand in front of you and mark the center of your pupil on the glasses, as well as the goggles. If you need to cut down the lenses (which are probably a type of polycarbonate) just make sure the marks match up before doing any cutting. We might give this a try with some wrap-around sunglasses to make an inexpensive pair of prescription cycling shades. [Spode] has been rocking out with a pair of Shure E4C earphones for about six years now, and he has no intentions of buying another set any time soon. The earphones cost him £200, so when the right channel started acting up, he decided to fix them rather than toss them in the trash bin. His first attempt was successful, but just barely so. 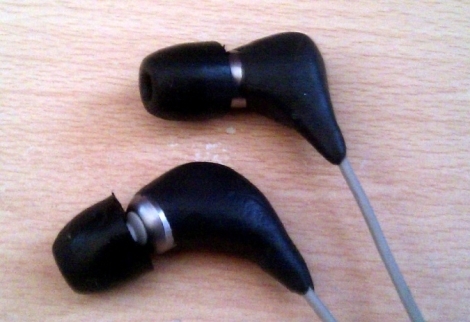 He ended up damaging the earphone case pretty badly, and in time the same problem reappeared. Undeterred, he opted to fix them once again, but this time around he did things differently. Upon disassembling them, he found that his repair job had become frayed over time. [Spode] desoldered both drivers from the wires and cut them back a bit to expose some nice clean (and structurally sound) cable. He spent a little more time carefully soldering things back together to mitigate the chances of having to repair them again before replacing both earphone shells with a bit of black Sugru. Having saved himself £200, [Spode] is quite happy with the repair. We probably would have tied an underwriter’s knot in each cable before soldering them to the drivers in the name of strain relief, though the Sugru should help with that. Would you throw this camera around on pavement and trust that it wouldn’t get broken? We have a hard time believing it too, but that’s exactly what happens in the video after the break. 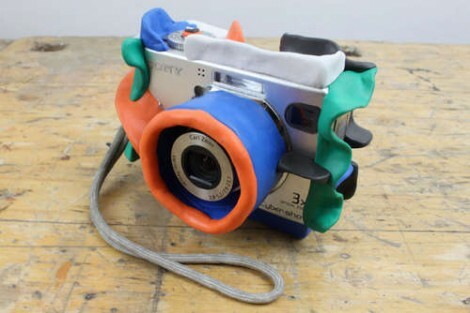 The colorful add-ons are pieces of Sugru creatively positioned to help protect the camera. From what we’ve seen this adds quite a bit of shock absorption, letting the normally delicate hardware bounce and roll. After all, the stuff is made from Silicone. It doesn’t look like the protection is meant to be removed from the camera, although we have seen Sugru used for that in the past so this method may be adaptable. A mistake was made during the project which prevented to battery compartment from being opened but it turns out you can peel the stuff of the camera later on, so this isn’t a completely permanent transformation. We’d wager the camera component to be most concerned with is the LCD screen. We’ve got one that cracked without any plausible cause to point to. But if you’re just reinforcing the device to hand to your kids, who cares if the LCD doesn’t work? It kind of makes it like a film camera again if you have to take all the pictures and then wait to use a computer to “develop them”. Don’t forget, if you don’t have Sugru on hand you can try mixing your own. If you follow Instructables.com, it might seem like every third article lately is about Sugru, the nifty air-drying silicone putty that’s good for all manner of repairs and custom parts. It’s fantastic stuff (and we love their slogan, “Hack things better”), but one can’t (yet!) just drop in on any local hardware store to buy a quick fix…so [mikey77] has cooked up a recipe for a basic Sugru work-alike. His “Oogoo” (a name likely inspired by oobleck) is a simple mix of corn starch and silicone caulk. A two-ingredient recipe would hardly seem adequate material for an article, but [mikey77]’s left no stone unturned, providing an extensive tutorial not only on mixing the compound, but how to add colors, cast and carve custom shapes, and how his home-made recipe compares to the name brand product. As a bonus, the article then drifts into a little Halloween project where he demonstrates etching conductive cloth, how to make conductive glue, and other hands-on shenanigans. Gerben liked Big 7 segment display. Mike Szczys liked Humanoid Robotic hand Mk 2. Mike Szczys liked ESP32 Camera board. AFZAL REHMANI has updated the project titled How To Make A Simple Mobile Phone Detector. Mike Szczys liked 3D printed prosthesis with CV, BCI and EMG. AFZAL REHMANI has added details to How To Make A Simple Mobile Phone Detector. Mike Szczys liked Vintage film viewers as RetroPies. Mike Szczys liked Sony Discman DIY Lipo Battery. Mike Szczys wrote a comment on Soda Bottle Display.